We are a proud manufacturer and supplier of extensive collections of Vacuum Degassers, which are of the highest quality. These are manufactured by procuring finest components from our trusted vendor base. We have team of quality controllers to keep an eye on every production stage to ensure that the products offered are of the excellent quality. Our collection includes Industrial Vessels, Anticorrosive Engineering Tanks and PP and FRP Products. We welcome queries for FRP Products from South India region like Dravida including Andhra Pradesh, Karnataka, Kerala and Tamil Nadu. 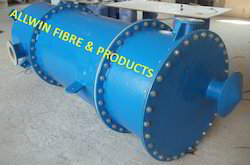 We are the leading supplier of extensive lines of FRP Degassers that are made out of high grade raw components under the supervision of our team of professionals. We have team of quality controllers to check quality at each stage of manufacturing process to ensure that the products manufactured are of excellent quality. These are known for its properties like long life service and excellent quality. These are extensively used in various industrial sectors.